Back in the (should I say: old?) days books were created from dead trees. Now, with the raise of different reading devices, we can read them digitally. Thanks to Kovid Goyal we can enjoy ebooks with the Calibre reader also on your ordinary PC or laptop. Calibre view your ebooks, displays table of contents (if available), can set bookmarks, and can copy text from your ebook. It can manage your ebooks by author, title, date, and other fields. Calibre can syncronize your ebook with some e-reader device attached on the USB port. Calibre supports a vast amount of ebook formats, including EPub, PDF, MobiPocket, and others (see Calibres’ FAQ page for the full list). Calibre can convert ebook formats. If you have downloaded or bought an ebook in a format that your reader does not understand, Calibre can convert it into something more useful with the any2epub tool. As you could see, Calibre is a very useful tool. However, Calibre’s main window is a bit strange (see screenshot): it wastes the available space and the icons plus their texts are far too big. Unfortunately one of the most used icons, View, appears to be the last in the menu bar. This is extremely annoying when you have limited screen resolution, for example on laptops and so called netbooks. Or you want to have only a fraction of your screen occupied by Calibres’ window. The result is the same: the menu bar displays a fraction of its icons and the important View icon disappears. You have to click on the » icon to overlay the rest of the menu bar to reach the View icon. 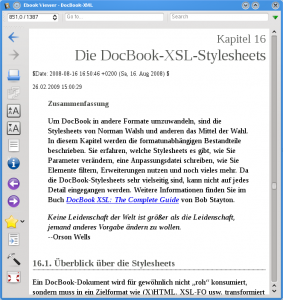 Apart from this usability issue, it does its job—viewing ebooks—very well. For example, this is a screenshot of the 2nd editon of my book in EPub (see 2nd screenshot). As far as I can see, it supports table of contents, CSS, and a lot more, all created by the latest DocBook stylesheets with EPub support. If you are interested in trying out Calibre, there are a couple of interesting webpages where you can download free ebooks. Look at www.feedbooks.com, www.gutenberg.org, or use your favorite Internet search engine. Sometimes they offer different formats. Look for EPub or MobiPocket formats as these are “reflowable”. Thanks for packaging this! I’ve been using Calibre for a while now and it’s nice to see a native openSUSE 1-click! Very nice! I know you’re not the author (or you would have said so…), but I thank you for bringing this very nice piece of software to my attention! Just wondering if you (or anyone else reading this): is it possible to read e-books (using calibre or otherwise, without resorting to wine and/or virtualized windows) that are encrypted? with “encrypted” you mean DRM (digital rights management), right? As far as I know, this is not possible with Calibre. I don’t know of a solution for Linux. Yeah, I do mean DRM (excuse the swear word…). And I did suspect that there was no readily available (or at all) solution for Linux as of now. Then again, for now I don’t need it either. It’s just one of those features that would be, sometimes, good to have in case you come across a publisher dead-set on the idea of drm. Well, you can always look for EBooks that doesn’t have these restrictions. For music is hasn’t worked so far. The question is, if this will work for EBooks. I don’t know, the buyers will decide. In case you need EBooks without DRM, I can highly recommend feedbooks.com. They only have content which copyright is expired. If you are interested in, for example, Sherlock Holmes you will enjoy it. At the moment I have to work on a laptop and if you are restricted to a smaller screen resolution you will notice the difference. 😉 It would make work much more easier if you could move the “View” button. But anyway, apart from this icon thing I really enjoy Calibre. Thanks for all your efforts and keep up the good work! I tried the 1-click and yast hacked up about nothing providing python-beautiful-soup. I’m running 11.1 64-bit AMD. Can someone point me to the package or repository I need to add to find said package? I couldn’t find anything in yast which remotely resembled that name. Never mind…I must be tired…I clicked on the “Customize” button this time and it let me check the python repo. Thanks for this package, it’s something i ‘ve been looking for! A bouncing cursor with some books loads for 10 seconds, then it goes away and no application loads. I am new to linux, so i don’t know what that means. All help appreciated! !